In 1990, William and Margaret Broussard founded the Allen Broussard Conservancy as a tribute to their son, who lost his life at age 29, from an infection after heart transplant surgery needed from resulting damage from chemotherapy after being diagnosed with Hodgkin’s disease at age 19. Allen was a conservationist and friend of Florida, forever. The Allen Broussard Conservancy (ABC), a 401(c)3 Florida Not-for-Profit Scientific Corporation, owns the conservation area known as Forever Florida. Long before cattle ranches, theme parks, or highways developed regions in Central Florida, the land was home to a wide variety of animal life. Even as Florida became more populated, large sections of Central Florida remained undeveloped due to the lack of roads. One of the few industries in the area was Consolidated Naval Stores, which harvested lumber throughout the Bull Creek area. By the 1940′s, Consolidated Naval Stores had completely harvested the local forests and ceased operations. They left the land barren, even disassembling the houses used for the workers. In the 1950′s, a Miami-based land consortium began selling plots of land in the Bull Creek area to unsuspecting real estate speculators. The lots of land were sold for approximately $5,000 each. Unfortunately for the hundreds of purchasers, the land was zoned agricultural and lacked access roads. Essentially it was worthless for any form of commercial development, and reverted back to its wilderness state. As the surrounding land became more developed, these parcels of land became the sole source of refuge for a variety of animals and birds. 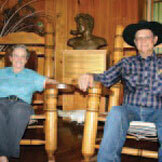 It was to this open range that Bill and Margaret Broussard came in 1969. Originally from a Louisiana ranching family and trained as a physician, Bill came to Florida following eight years of military service to establish a medical practice and get back into ranching. The Broussard’s set out to create a fitting tribute to their son Allen’s legacy and in 1990 founded the Allen Broussard Conservancy. The Crescent J Ranch is a working horse and cattle ranch, located within the lands known as Forever Florida, and is a key part in the mission of ecological education and preservation of native Florida land and species. Florida has a rich history, in both nature and society. The moment the Spanish set foot on the peninsula, Florida would be forever changed. From the get go, honoring history and providing a glimpse into the heritage of the land we inhabited was important for us. The day Allen told his father about his concerns at the disappearance of Florida’s natural beauty was one of the last days they would be together. Help us conserve these beautiful wetlands by making a charitable donation today!